Dreaming About a New Home? Whether you are actively looking for a new home or thinking it might be time to consider moving, checking out Open Houses can be a lot of fun. You’ll see what you get for the money and check out neighborhoods you might have considered. Open houses are typically held on the weekends and give you quite a selection to consider. Finding them is easy, too. You no longer have to search the newspaper for the opens. 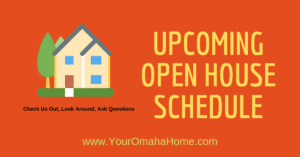 The Open House schedule is right here and will be updated as new Opens are scheduled. Or for easier access, click here and download my app to keep on your phone. Are you thinking about buying your first home? You don’t have to do it alone! Our real estate agents are looking forward to working with you to make your real estate dreams a reality. Call us at 402-880-9027 today! In today’s real estate market, you want someone on your side with the knowledge and experience to properly market your home. Our real estate agents have the skills, creativity, and experience it takes to get you the most from the sale of your house. Call us at 402-880-9027. ©2018 Keller Williams Realty, Inc. is a real estate franchise company. Each Keller Williams office is independently owned and operated. Keller Williams Realty, Inc. is an Equal Opportunity Employer and supports the Fair Housing Act.